Applying eyeliner is a common pain point among women, especially among makeup beginners. The whole thing seems so tedious, and crooked lines can quickly appear and destroy the whole looks. The struggle is real – and so here’s one makeup hack that you’ve definitely thank us for. 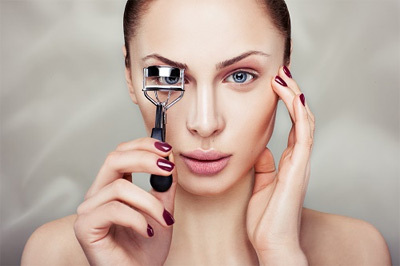 Did you know that an eyelash curler can help you achieve the perfect eyeliner? In a nutshell this technique involves applying the liner using a brush or felt tip applicator, with the aim of giving an outline for drawing that perfect line. Think of this as hitting two birds with one stone: it will curl your lashes and give you an outline to line your eyes. It’s a time-saving tool this way! In addition, the curler is rounded to fit your eye shape. Since the rounded portion sticks to your eyelid, the outline will also turn out rounded and defined as you prefer. This makeup hack might not work perfectly upon first try, but give it one to two more attempts to master the trick. Apply a coat of liner to the base of the metal portion of the eyelash curler with a brusher. If you are unsure what this part is, this portion sticks to your eyelid when you curl your lashes. Curl your eyelashes using the curler. While doing so, gently press the base of the curler against your eyelid, making the liner transfer from the curler to your upper lash line. Taking the curler off will give you a rough outline of your eyeliner. Use the connect-the-dots method: line your eyes through taking the reference of the outline that your eyelash curler created. Keep it simple, or add a wing!